In outline, Results sounds like radical departure for Bujalski following his most experimental feature Computer Chess; with its high profile cast, large budget, classically constructed narrative and general ambience of light-weight airiness. However, it too explores the ways in which a high-pressure workplace can shape the thought processes of its employees, and the frictions that result when a foreign element is inserted and ruptures this tight knit community. Here, the cult-like rhetoric of tech-speak is replaced by the cult-like rhetoric of self-improvement, which is often just as alienating. The actions revolves around the Power 4 Life gym, run in a suburban Texan strip mall, run by Trevor (Guy Pearce), whose intense dedication mostly makes up for his lack of competence. 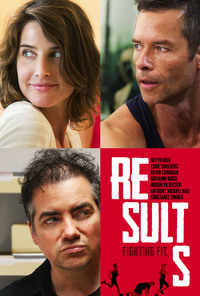 Danny (Kevin Corrigan), recently divorced and newly rich after his mother’s death, decides to sign up for 2 years’ private sessions (all at once, in cash), and quickly becomes infatuated with his trainer Kat (Cobie Smulders), who, as it turns out, used to date Trevor. Danny is such an unambitious slob that he even lacks the motivation necessary to be driven crazy by wealth, even though it does bolster his sense of entitlement. For the most part, he treats the task of having to think of ways to spend the money as a burden; at one point, he offers a neighbour $200 to come over and figure out how to turn on his new TV, at another he casually offers to give his expensive home gym set to Trevor for free in a fleeting moment of self-doubt. The financial windfall doesn’t change his lifestyle much, but now he orders pizza, smokes weed and watches YouTube videos within a spectacularly lavish mansion. Bujalski’s approach is to take a triangular formula familiar to romantic comedies and complicate it with fully realized characterizations that ground these archetypes within reality: the geeky underdog, the unattainable object of desire, and the jock who competes for her affection. But, in this case, Trevor is just as neurotic and tightly wound as Danny, and his unnatural attachment to the fitness lifestyle a way of adding a reassuring sense of structure and coherence to his existence. Similarly, Kat’s flightiness and emotional volatility are the products of a self-destructive anxiety she turns to excessive exercise to alleviate. Incredibly rich in characterization through minor details and gestures, such as Kat’s subtly evasive response when Danny asks if she’s had any experience with psychiatrists, Danny disguising his showing off as being self-effacing when he and Kat first meet (which becomes more overt as he realizes that she’s non-responsive), the way Trevor compares every process in his life to bodybuilding. Bujalski usually places the characters within wide frames, largely allowing psychology to be expressed through physicality and examining the ways in which they interact with their surroundings. Though it lacks the thematic scope and formal playfulness of Computer Chess, this level of empathy and nuance is rare to see in the contemporary landscape of American Independent cinema. This review was published on June 09, 2015.